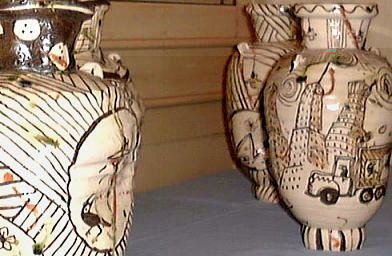 One of Japan's most prolific ceramic artists is Suzuki Goro (1941-). His career started way back in his teens when he would only get about three hours of sleep each night because he wanted to practice on the wheel.  His goal: to make 1,000 yunomi (tea cups) in one day. Only then, he felt, could one be called a craftsman. He had a stopwatch next to the wheel and after three years of practice got to the point where he could make a yunomi in 30 seconds! He reached the 1,000 mark and surpassed it, finally resting after making 1,250 yunomi in 10 hours. The man was on a clay mission. He's since moved on to other forms, focusing his ceramic vision on Momoyama-inspired Mino wares which include Shino, Oribe, Setoguro, and Ki-Seto. Yet instead of making boring copies of the masterpieces, Suzuki has allowed himself, after years of discipline, a little freedom and, very importantly, a playful spirit (asobi-gokoro). He also has a feel for clay in his bones and listens quite well to the voices of the many different clays he uses. To celebrate the 30th anniversary of Sun Sumie Gallery in Nagoya, a special exhibition titled Suzuki Goro no Sekai (The World of Suzuki Goro) is on now until July 27. 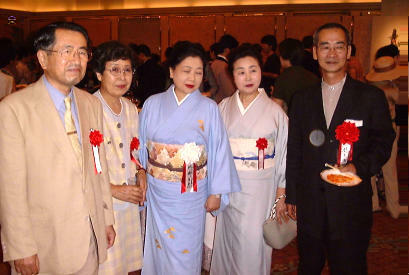 The exhibition opened on the 13th, yet the day before a grand party was held at a local hotel's banquet hall and I was lucky enough to attend. It's hard not to marvel at the creativity of Suzuki -- he's really in a class all by himself. 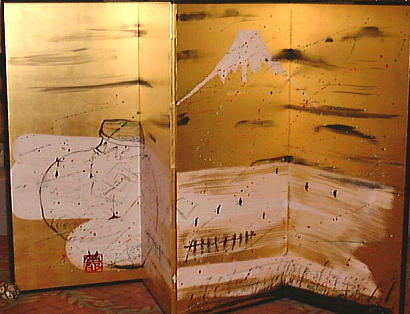 From his wonderful folding screens (byobu - see below photo) down to his small traveling chawan (tabi-chawan - 2nd photo below), there is a sense of a man lost in some very serious play. Most times his visions turn into a clay masterpiece, like his life-size chairs or tsubo jars. Other times, well, I'd say it's taken a tad too far as when he paints colorful motorcars or buildings on his L.A. chawan and other pots (below two photos). 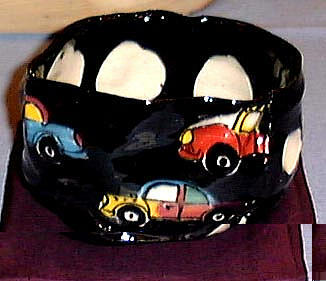 Suzuki works in many other designs as well, both traditional and original. His favorite designs these days are the crow and a, well, rather relaxed female figure. 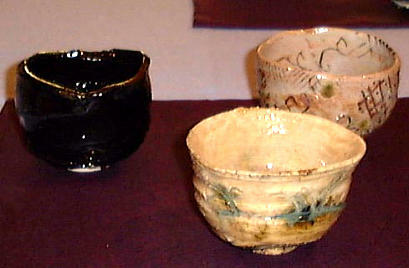 He puts these everywhere - in sake cups, inside large tsubo, and on chairs as well. 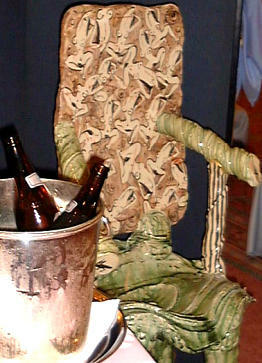 In front of one chair stood a champagne cooler containing empty beer bottles instead of champagne. One often forgotten technique of Japanese pottery, and one that no contemporary potter does better than Suzuki (actually, Suzuki may be the only potter doing it), is yobitsugi. 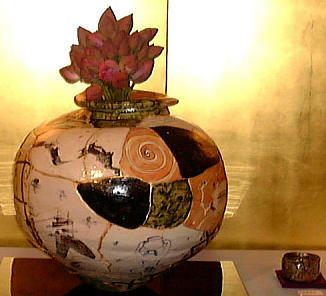 Yobitsugi is a grafting of different style shards soldered together with gold to create a patchwork pot. 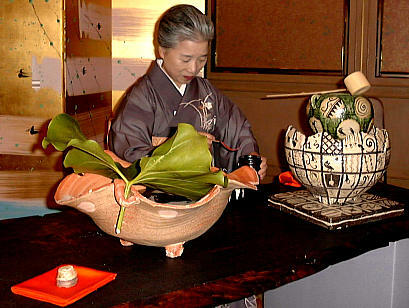 In the past, tea masters would break bowls on purpose, as Suzuki does too, to graft pieces together to suit their personality. In the exhibition was a large tsubo with Oribe, Shino, Black Seto and sometsuke shards pieced together; quite the exhibition's showcase piece and aptly toped off with some magnificent flowers by a local master. 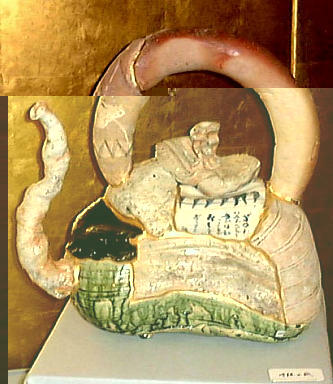 Another fine yobitsugi piece (below) was a large dobin tea pot. 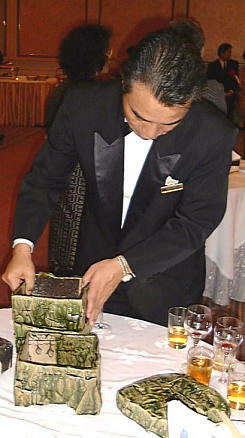 Lunch was served in Suzuki's stacked boxes (jubako). At the end though they had the staff wondering how to put them back together! I think they were also a bit nervous as well after hearing the cost for one such stack (below). The smallest items in the exhibition were kiseru pipes. These have a long history with the tea ceremony but I don't think any have been made like Suzuki makes his. The colors! Not very quiet and contemplative pieces in the least - ceremony participants usually light up the pipe in a peaceful garden while waiting to enter the tea room. 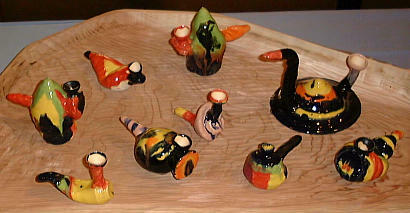 These looked more like small coral snakes or gila monsters and were all playfully set upon a large wooden tray. 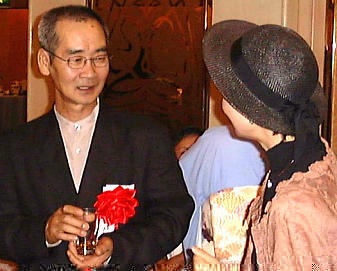 I feel blessed to be alive and able to meet Suzuki Goro and other great talents working within the flow of time.